Cast iron pans are great to cook with, as they provide even and consistent heat, and clean up easily as well. When properly seasoned, cast iron will release food naturally, meaning you never have to fight to get overcooked items off the bottom of the pot or pan. Remember the golden rule of cast iron, and never add soap to clean a pan. Soap will remove the oils that keep cast iron seasoned, which in turn means you never need soap to clean it. There are times when foods burned to the bottom can challenge you but have no fear. Camp Chef makes products to help clean cast-iron pots and pans. Lemon juice is a common ingredient to help lift baked on items from the surface of the iron. Coarse salt is also a great agent for scrubbing a pan. For difficult items, chain mail is used to scrub items off the iron surface. Cooked on items are not held deep in the iron, but instead are on the surface, where they can be removed even in tough cases. A seasoned cast iron pan that has been used for cooking, and has cooked or burned on particles, can be put back on a heat source and filled about halfway with water. As the water begins to boil, food particles cooked onto the iron will release. In most instances, a plastic scraper will allow you to remove food particles cooked onto the bottom. Boil water and let the hard-to-clean pan simmer for 10 minutes or more to soften up cooked on grunge. Try a plastic scraper or plastic-bristled brush that has never been used with soap. If the items do not lift off, get out the chain mail and give the pot a good scrub. The burned-on bits will surrender to the chain mail, even in the worst cases. Once your cooking vessel is clean, it is time to give it a touch of seasoning, which can be lard, vegetable oil, or commercial brand seasoning, which often includes coconut oils and other viscous food products. Add several tablespoons to your pot or pan and wipe it around the entire cooking surface with a paper towel or cotton cloth. The pan can then be stored until the next use, ready to work like it always has. If you store your pans for long periods, you may want to boil some water in them first and apply a fresh coating of seasoning before use. An oiled pan can collect dust, and some oil can taste old. A quick clean and fresh seasoning will ensure everything tastes exactly like it is supposed to. If you aren’t using cast iron, it is about time you checked out this time-tested method of cooking. The pots and pans are heavier to deal with but are a healthy option for the entire family and are still the original non-stick cooking surface that works every time. 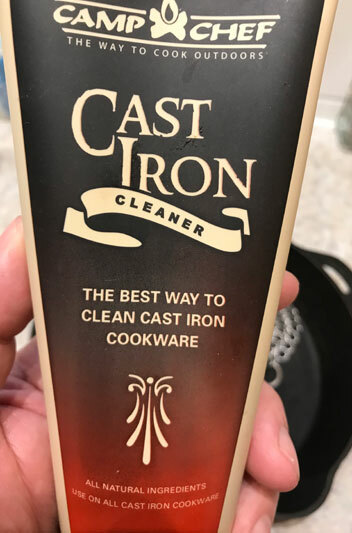 The cast iron motto is: you take care of the iron, and it will always take care of you. During the end of January and the month of February, walleye fishing can be tough. Locating a spot to fish for walleyes these two months isn’t hard, but the tactics definitely change from when you fish for walleye the other months of the year.